‘So what do you play?’ It’s a frustrating question because it’s akin to asking an English Literature academic what their novel is about or asking an art historian where their next exhibition is going to be shown! There are many different types of musicologist, but I am essentially a cultural and social historian, whose work is concerned not so much with analysing the scores of musical works as with investigating the social, political and aesthetic contexts that shaped the works themselves and their subsequent performance and reception. I am particularly interested in this latter point: how works of music – operas in particular – were understood by the audiences and critics of their day, and how they have been reinterpreted and appropriated for various purposes over the centuries or decades since. 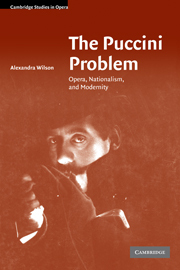 For example, my first book, The Puccini Problem: Opera, Nationalism, and Modernity (Cambridge University Press, 2007), examined responses to Puccini’s operas in Italy during his lifetime. Despite not having very strong political views, Puccini found himself being dragged into a panoply of politically charged debates, about gender, race and the cultural identity of the new Italian nation. As a historian, one finds oneself ‘camping out’ for a protracted period in a particular era. It has to be a time – and a place – that one finds sufficiently fascinating! During my PhD and for many years after, my ‘spiritual home’ was Italy roughly between the years 1895 and 1925, which was not a bad place to hang out. In more recent years, I have shifted my attention to Britain in the 1920s, an equally engaging epoch that holds many attractions for the cultural historian in terms of fashion, visual design, architecture and literary developments, as well as music. A year’s research leave funded by a British Academy Mid-Career Research Fellowship resulted in my new monograph, Opera in the Jazz Age: Cultural Politics in 1920s Britain (Oxford University Press, 2019). The book is a study of the lively and sometimes vicious arguments that took place about opera during the 1920s. So why this era, particularly as it was not really a golden age for either the composition or production of opera in Britain? First, the 1920s was a decade that witnessed an explosion in popular culture. Opera suddenly faced a threat from all sorts of new forms of entertainment – film, social dancing, various types of sport, jazz clubs, even the possibilities for audiences to simply stay at home and listen to a gramophone record or the wireless. I wanted to investigate how opera fitted into this sparkling new entertainment world, and discovered that it interacted with these supposed threats in all manner of intriguing ways. Second, the 1920s was the era of the ‘battle of the brows’ – a heated debate that took place among cultural commentators about whether various forms of art were ‘highbrow’, ‘lowbrow’, or that newly coined term, ‘middlebrow’. This is a phenomenon that has been examined in depth by literary scholars, but music’s relationship to it has thus far attracted little scholarly attention, and I was keen to find out where opera was considered to sit on the highbrow-lowbrow spectrum. The answer turned out to be rather surprising. Opera proved extremely difficult to pigeonhole and most of the self-styled highbrow commentators of the day considered opera contemptibly popular and trivial – not highbrow enough! I undertook most of the research for the book using the resources at the Bodleian Library in Oxford and the British Library, although specialist archives also proved useful, particularly the V&A Theatre and Performance Collections and the BBC Written Archives Centre. I used a wide range of journalistic sources (daily newspapers, specialist music magazines, general cultural reviews) to trace the debates of the day, but also memoirs, opera programmes, biographies, novels, short stories, films, and satirical cartoons. In my book I examine the question of opera’s placement in the ‘battle of the brows’ from a number of perspectives. Different types of opera were categorised differently (highbrow commentators looked far more favourably upon German opera than Italian, and upon early opera or modernist opera than the mainstream Romantic repertory). I look at the ways in which operas were dragged into discussions about celebrity culture, national identity and even imperialism, and how all of these had an impact on its categorisation. More broadly in terms of social history, I examine opera’s performance contexts. It was performed during this period to socially mixed audiences – with a particularly enthusiastic working-class following in South and East London and the industrial cities of the North – in a variety of spaces beyond the conventional opera house: music halls, cinemas, restaurants and schools. There was little sense in the 1920s that opera was ‘elitist’, in the way in which it is so often caricatured today. Opera, in fact, was very much for everyone and a part of everyday life. So my next project, supported by a Major Research Fellowship from the Leverhulme Trust, is to write a sort of sequel to Opera in the Jazz Age, investigating how attitudes towards opera have hardened over the period from the end of the 1920s to the present, pinning down exactly when the ‘elitism’ tag began to be used and demonstrating why it is a problematic term. I can’t wait to get stuck in. About the Author: Dr Alexandra Wilson is Reader in Music at Oxford Brookes University, where she researches the social and cultural history of opera. She is the author of Opera: A Beginner’s Guide (OneWorld Publications, 2010) as well as The Puccini Problem: Opera, Nationalism, and Modernity (Cambridge University Press, 2007) and Opera in the Jazz Age: Cultural Politics in 1920s Britain (Oxford University Press, 2019).